Once you have created a Trip you can then link forms to it. The forms that you can link to a Trip are defined by your management company and typically include forms such as passage plans and departure checklists. You will then need to click on the 'Missing Forms/Add Form' tab to see a list of forms you can add to a trip. Click the 'Add Form' icon next to the form you wish to create and you will be taken to a blank instance of the form to complete. Once you have entered the necessary information click 'Submit and Check In' to submit the form and link it to the trip. 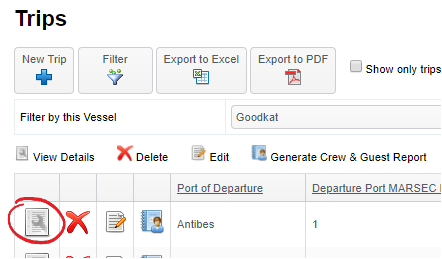 If you have already created the form you can link it to the Trip by clicking the 'Select Existing Form' icon. This will then provide a list of forms for you to select. Once checked click 'Submit' to link it to the Trip. If your management company has designated this form as optional, you can make it n/a by clicking the 'Mark as Not Applicable' Icon.